This collection of essays from the 45th annual Brigham Young University Sidney B. Sperry Symposium offers a strong foundation for a deeper understanding of the Restoration. The keynote address by Robert L. Millet highlights the restoration of plain and precious truths. Readers will learn about how we understand LDS history and doctrine, about the beliefs declared in the Articles of Faith and how we apply their truths, about the development of temples and temple ordinances, and about the restoration of true Sabbath worship. 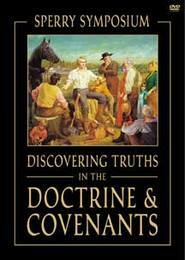 Also included are chapters on the historical development of sustaining members of the First Presidency and Quorum of the Twelve as prophets, seers, and revelators; and the harmony and counsel needed in their declaring doctrine and making administrative decisions. Barbara E. Morgan has a master's degree in educational leadership and foundation and a PhD in instructional psychology. She currently teaches at BYU and serves as the LDS higher education chaplain-at-large and as a member of the Religious Outreach Committee. Craig James Ostler has been a professor of Church history and doctrine at BYU for more than 20 years. He received a PhD in Family Science, an MA in educational administration, and a BA in Spanish teaching, all from Brigham Young University. Before coming to BYU, he taught in the Church Educational System for 15 years.